WTH?! (What the Heck?) moments are attempts to find the memorable and the off-beat perspective on Longhorns sports. Here are some interesting moments from the Texas’ game against the Lobos. Pre-Game (15:00) WTH Coin Toss?! It was tough to watch Earl Campbell with his cane slowly walking to midfield. I do still love watching highlights of the Tyler Rose running over and past people. I am glad that DKR did a better sales job than the Bootlegger Boy. 1st Quarter (8:50) WTH VY?! I know that Vince Young has moved on, so who was running 49 yards for a TD from the quarterback position. David Ash had another solid game (16-22 for 221 yards) with no turnovers. I hope he continues to avoid the oskies. 1st Quarter (:00) WTH TOP?! 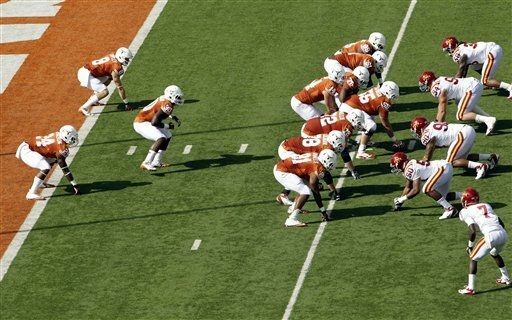 I understand the concept of bending but not breaking when you describe a defense, but these Horns were T-O-P to death to start the game. The Lobos held the time of possession for 12 minutes and picked up 7 of its 16 first downs in the first quarter. 2nd Quarter (15:00) WTH Wendy?! Wendy’s restaurant brought back former UT kicker Ryan Bailey to kick a 40 yard field goal for everyone to win a frosty. I guess the Nebraska game in 2006 was nothing compared to the pressure of feeding 100,990 fans. He missed. 2nd Quarter (9:55) WTH Fans?! I know the UT players would like the fans to be louder. You can see the kids waving their towels to get the crowd going. The home crowd did cause a delay of game for the Lobos when the Godzillatron screamed for NOISE. 2nd Quarter (5:54) WTH Error?! I guess I have a new nickname for Nick Jordan. The kicker missed another 40+ yard field goal. I think the frosty giveaway also affected Error Jordan. Fera where are you?! 3rd Quarter (12:12) WTH Daje?! Wow. Pure speed. Daje Johnson took a shovel pass for 45 yards to pay dirt to take control of the game. Glad he did not choose his first love which was basketball. 4th Quarter (:00) WTH Critics?! I have heard a lot of critics say how this team is not dominating. Granted it does take this team takes a while to get going, but isn’t a shutout a pretty good start to the season. There is no preseason for these boys to tune up, so next week’s road game will probably show us what type of team we can expect. Next up for the Longhorns is their first road game against the Ole Miss Rebels on September 15th.